A company that owns several of the most profitable institutions in Santa Cruz, yet doesn’t pay its workers enough to purchase fresh produce, should not hold sway over how their community feeds themselves. The Beach Flats Community Garden is a verdant square in the quilt of the Beach Flats neighborhood, primarily home to Latinx immigrants. Gardeners use the space to grow vegetables and tough-to-find culinary herbs for their families and those in need. What started 25 years ago as a way to grow food has since cultivated community pride and cultural expression. The Santa Cruz Seaside Company is a local titan that owns the Santa Cruz Beach Boardwalk and several other tourist traps around town. The company had leased the Beach Flats lot to the city for general use for a little over two decades. Recently, Seaside decided to reappropriate it to start a nursery for their own landscaping needs, destroying an entire community’s food system in the process. Seaside’s timely reclamation of the plot is environmental racism, an insidious kind of institutional discrimination encompassing the frequent abuse of the environment around marginalized communities. This often happens due to lack of fair representation in local government or the community’s ability to fiscally resist hegemonic actions. Beach Flats is something of a food desert. The closest affordable grocery store is Trader Joe’s, a twenty minute walk, but even that isn’t adequate for a family on a budget. Thanks to Seaside’s monopolization of the beachfront business area, access to a garden nearby has become a necessity for families in Beach Flats. The ability to grow fresh food is an invaluable asset to a community severely threatened by encroaching gentrification. Seaside is a dangerously bloated company that, ethically, shouldn’t expand more than it already has. To take away the opportunity to garden from marginalized people would be another step toward erasure of the communities that make Santa Cruz the place it is. Gentrification and increasing commodification of necessities are systematically pushing people of color out of Santa Cruz. When the city can’t even find a way to preserve one of its few community gardens, it has a lot to be ashamed of. In 2016, the Santa Cruz City Council signed a three-year lease that turned 10,000 square feet of the lot over to the Seaside Company for its own discretion, leaving 16,000 square feet for the community. The company is vying for complete control of the garden by 2019. Seaside promptly bulldozed its section of the garden, demolishing several mature fruit trees and nopales, or cactus pears, in the process — all of which were meant to be relocated to another part of the plot. While it did not seize the whole plot, the company took a noticeable bite out of the garden. Seaside displaced the gardeners, then disrespected them by demolishing their hard work and leaving the land fallow. This sends a clear message to the residents of Beach Flats — nothing they grow, community or otherwise, is worth saving to the corporate interests that possess Santa Cruz. Since the garden was bulldozed, sharing culturally relevant food has become not only a form of community building but also of both cultural and physical survival. It is not by chance that the same company profiting off Santa Cruz’s constant stampede of tourists controls one of the only nearby spaces for respite from the Boardwalk’s nonsense. Nor is it chance that after 25 years of hard work sown in reconstruction, soil repair and unpaid labor by the local gardeners, the same company chooses now to reap the benefits. This is cold, calculated and predicated on the racist assumption that when people of color work, they work for others. The citizens of Santa Cruz need to look beyond their personal investment in issues that affect their city. They need to start questioning the power of the Seaside Company and other local conglomerates and their role in city dynamics, and demand that they release excess land back for civic use. Spreading awareness and information about the Beach Flats issue on social media and in person to other residents of Santa Cruz is vital. Exposure brings injustice into the limelight for the greater community who may not be aware of the struggle between this community and the monopoly of the Seaside Company. 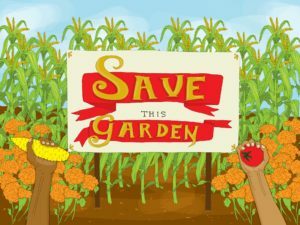 Petitions are circulating, and you can make a donation to the Coalition to Save the Beach Flats Garden or contact the Seaside Company as well as local government officials. If Santa Cruz is going to talk a big game about locally sourced produce and organic farming practices, they better support it when it’s in their neighbors’ backyards.